The movement aimed at calling attention to injustice in the American financial system prides itself on having no central leadership, and it’s been criticized for having no central message. Here’s how it’s working anyway–and changing the way we think of protests. Writing about Occupy Wall Street is a journalist’s nightmare. Not because there aren’t tens of thousands of protesters, charismatic talking heads and colorful photograph opportunities–there are plenty of those. Instead, you have to owe up to the challenge of writing about a communal protest movement where there are no clear “leaders” and no official “organizers.” For those of us weaned on writing about top-down hierarchial organizations with CEOs, presidents, advisory boards and parliaments, it’s a challenge. Then again, shaking up the norm–from the way the financial system works, to how a protest unfolds and is reported upon–is what Occupy Wall Street is all about. What we are seeing right now in Zuccotti Park in lower Manhattan (and even in new spots around the country) is a new kind of protest. The collective organizers of Occupy Wall Street are shaking up our conceptions of leadership and social action. A carnival-like atmosphere has arisen just across from the giant Harry Helmesley sign and that one street cart with the really good falafel and it has no signs of going away soon. The real question is how the people behind this very successful protest can turn their movement into everyday gains for the tens of millions of Americans who have been crushed by the downturn. The answer likely lies in a handful of important activists, organizations, and sympathizers who have helped make everything from food to funding happen for Occupy Wall Street participants–knowingly or otherwise, they’re a new kind of leaders for a leaderless movement. The protest as it stands today emerged from a heady mix of Anonymous‘ hacker libertarianism, Adbusters‘ media-savvy culture of art student resistance, and the indigenous post-1960s American far-left which was raised on a steady diet of Food Not Bombs, Critical Mass, and anarchist infoshops. Rather than having official organizers, the protest (and its satellite spin-offs around the country) instead rely on a massive group assembly that uses an ingenious system of hand signals to enable communal decision making. It’s very low-tech, but it gets things done. Canada’s Adbusters collective has made anti-consumerism hip through a glossy magazine and a wealth of stylish web materials; the organization co-issued the original Occupy Wall Street call to arms. The loosely organized Anonymous collective, who co-issued Occupy Wall Street’s original call to arms, are “legion” and have risen from their 4chan roots to become one of the internet’s most impressive activist organizations. Brandt, a veteran communist-leaning journalist from New York, spearheaded the Occupy Wall Street Journal‘s $50,000 fundraising drive on Kickstarter. 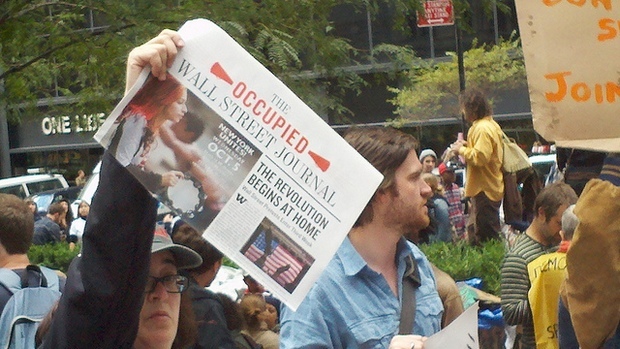 Occupy Wall Street’s pointman for media has become a regular presence in the mainstream media. Aiming to “reclaim democracy,” the Day of Rage collective were one of the co-organizers of Occupy Wall Street. New York’s largest municipal employees union has thrown its weight behind Occupy Wall Street, guaranteeing massive local turnout of day-tripping city employees to protests. Graeber, a prominent anthropologist and anarchist activist, played a key part in helping formulate the tactics that made Occupy Wall Street so successful. Ianucci, the president of the powerful New York State United Teachers union, was responsible for much of the turnout to Wednesday’s megamarch. The actual “leaders” of Occupy Wall Street, the General Assembly are a collective who make the decisions that make the large protest flow. Labor unions have embraced Occupy Wall Street; Wednesday’s megamarch through the Financial District was fueled largely by influential labor unions who have entered into an alliance of shared interests with the protesters. The backbone of Occupy Wall Street’s decision-making process is the New York City General Assembly, a parliament-like organization that describes itself as an “open, participatory and horizontally organized process” and which anyone can join. The General Assembly has its roots in New Yorkers Against Budget Cuts (NYABC), a loose collection of labor activists, left-wing lifers, students, and academics who organized a tent city a few blocks away from City Hall called Bloombergville in protest against city budget cuts that got relatively little media coverage. NYABC has close ties to the city’s labor unions (the organization obtained meeting space from DC37, New York’s massively powerful municipal workers union) and to the substrate of activism that stayed strong in the city; the organization’s media representative, Doug Singsen, is an influential figure in the movement to prevent budget cuts to New York’s public universities. Teaming up with the amorphous collectives of Adbusters, Anonymous, and Day of Rage (another organizing group) was the perfect solution for the budget cut activists who formed the nucleus of the General Assembly. The fact that the American economy is in a wretched state, with millions of Americans suddenly excluded from the job market and trading houses seemingly being rewarded for inventing reckless financial instruments, has meant that the time is ripe for a broad-based protest movements. The worldwide collectives who publicized the movement guaranteed media attention and a steady stream of migrants to the new tent city/carnival/protest movement. Meanwhile, the nucleus of protesters who formed the General Assembly were able to provide the boots on the ground to do the grunt work. 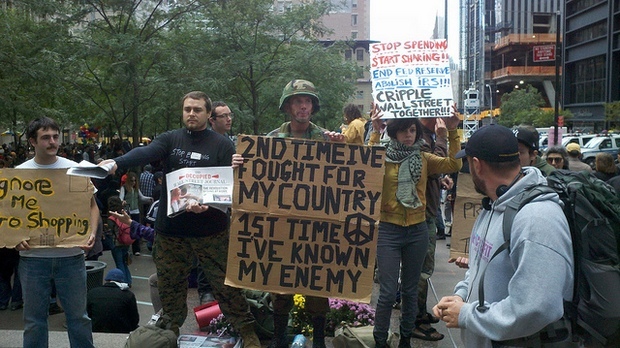 Due to the General Assembly’s open nature, it quickly swelled with new attendees to Occupy Wall Street. The General Assembly is currently an open-access democrat’s dream; the collective posts full minutes and detailed meeting information online. The decision-making process behind Occupy Wall Street itself was convoluted. After Adbusters launched the original call for the protest, the first General Assembly was held on July 2. At that time, a small seed group that included prominent anthropologist David Graeber led efforts within the assembly to drastically retool the protest. Adbusters’ original plans called for the protest to start on a Saturday (when Wall Street is nearly empty and media coverage is at a minimum) and also made the protest dangerously liable to hijacking by fringe organizations whose messages would be unpalatable to the general public. One of Occupy Wall Street’s greatest strengths is the collective’s agile use of social media and (in the past week) crowdsourced knowledge of how to handle mainstream media attention. Veterans of the long-lasting Independent Media Center have helped operate a press center that puts out a print publication, the awesomely named Occupy Wall Street Journal, which has turned into a cult item among New York tourists. Occupy Wall Street has already raised over $50,000 in publishing costs via Kickstarter. Jed Brandt, a far-left-wing activist and “revolutionary journalist,” played a key role in fundraising. Occupy Wall Street and their many sympathizers–especially the super-web-savvy Anonymous collective–seem to have successfully retooled the Egypt/Tunisia model of social media revolt for the American public (something this reporter originally doubted). Occupy Wall Street even has an official spokesperson of sorts, 23-year-old Patrick Bruner. The Occupy Wall Street collective relies on a vast network of sympathizers to help fund the considerable costs of keeping the protest going. An impressive logistics system has arisen at Zuccotti Park that includes a kitchen (fueled by donations), clean water distribution, a lending library, day care, children’s activities, and getting clean clothes to protesters who stay overnight. Using smaller sites such as WePay and Kickstarter was a decision undoubtedly influenced by PayPal’s infamous decision to cut off WikiLeaks. Meanwhile, the regular members of the General Assembly are basking in their success. Genius media stunts such as silly as a rumor that the band Radiohead were playing the encampment to the much more serious recent Brooklyn Bridge takeover coupled with the arguably brutal and disproportionately violent behavior of the New York Police Department have grabbed mainstream media attention. And the arc of the media coverage has been changing. While earlier reports treated the protesters as a motley crew of freaks and fringe figures, coverage in influential sources such as CNN, MSNBC, and (especially) the New York Daily News has become positively glowing. The core message of the Occupy Wall Street protesters–an end to corporate greed and financial wrecklessnes–has struck a nerve with massive swaths of the American public. Influential labor unions such as the AFL-CIO’s Richard Trumka, the Communications Workers of America, and the massively powerful local chapter of the United Federation of Teachers, the NYSUT, have all thrown their weight behind the protests. Suddenly an awful lot of people are finding themselves swept up by a leaderless movement with no pithy message.